Kernels are used to smooth the periodogram by using a weighted moving average of nearby points. A smoothed periodogram is defined by the following equation. 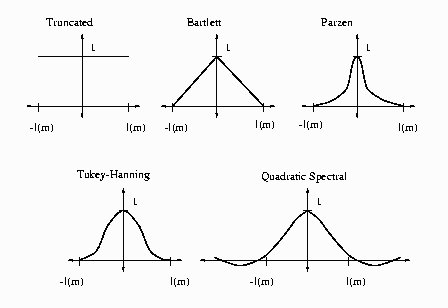 The SPECTRA procedure supports the following kernels. They are listed with their default bandwidth functions. See Andrews (1991) for details about the properties of these kernels.